Keith Keldie was crowned North of Scotland Highland Masters Champion recently. 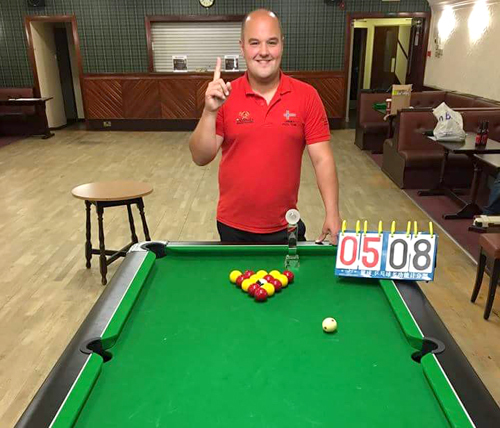 On the back of Rachael Sutherland’s selection for Scotland, Keith Keldie maintained the feel-good factor surrounding Orkney pool, being crowned the North of Scotland Highland Masters Champion. Keldie says the win ranks as his greatest achievement to date in a stellar pool career, as he fought back from 5-2 down to beat Fraserburgh’s Andy Gerrie 8-5 in Sunday’s final of the two-day competition in Forres. Keldie’s triumph, emerging as cream of the crop from 64 of the best players in the north of Scotland, leaves Orkney pool on a euphoric high following Sutherland’s recent inclusion in the Scotland ‘A’ side. He also helped himself to a cool £1,000 prize. “This is probably my best achievement, being the first time I’ve won an event away from Orkney, and it is always harder in a competition spread over two days,” said Keldie. Read more in The Orcadian.